Kefir comes from the Turkish word “Keyif” meaning “feel good”, and it’s designed to do exactly that. Water kefir is a fermented drink made from a live culture of friendly bacteria and yeast, creating a fizzy tasting, gut- loving beverage. 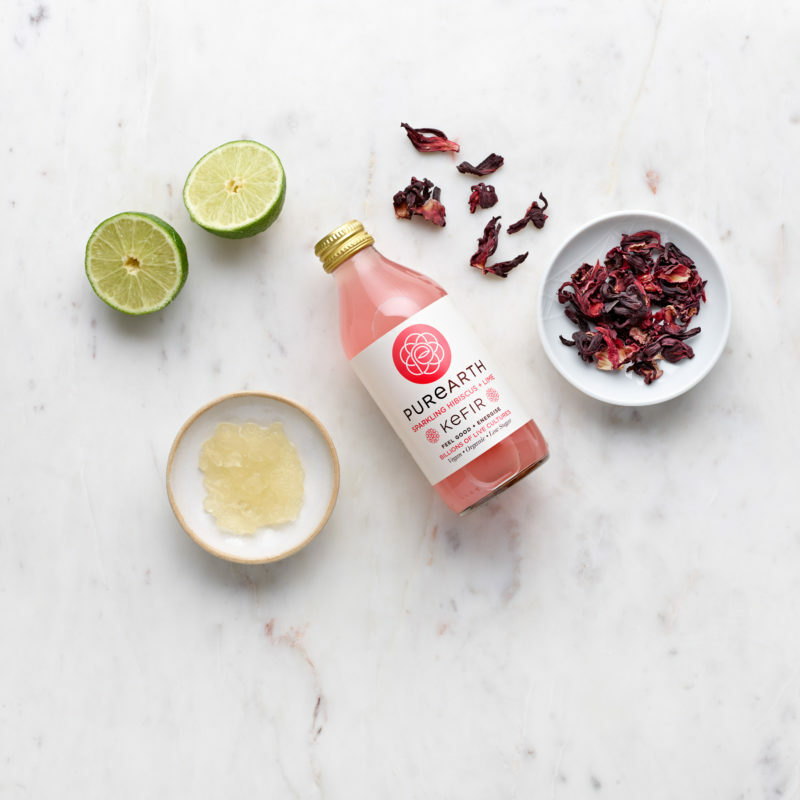 Containing over 20.5 billion lives cultures per bottle, including lactobacillus and bifidobacterium (probiotics) our water kefir is teeming with beneficial digestive enzymes, amino acids, vitamins, and minerals that make us feel amazing. Many people are familiar with milk and yogurt-based kefir, but our dairy-free water kefirs are the first of their kind in the UK. Infused with organic superfoods, our kefirs are 100% raw, unprocessed and unpasteurized. This means that whilst our drinks aren’t preserved the benefits are. Our water kefirs are caffeine-free, gluten-free, dairy-free, low in pre-digested sugar, vegan and 100% natural. But most of all they are simply delicious, refreshing, sparkling drinks! 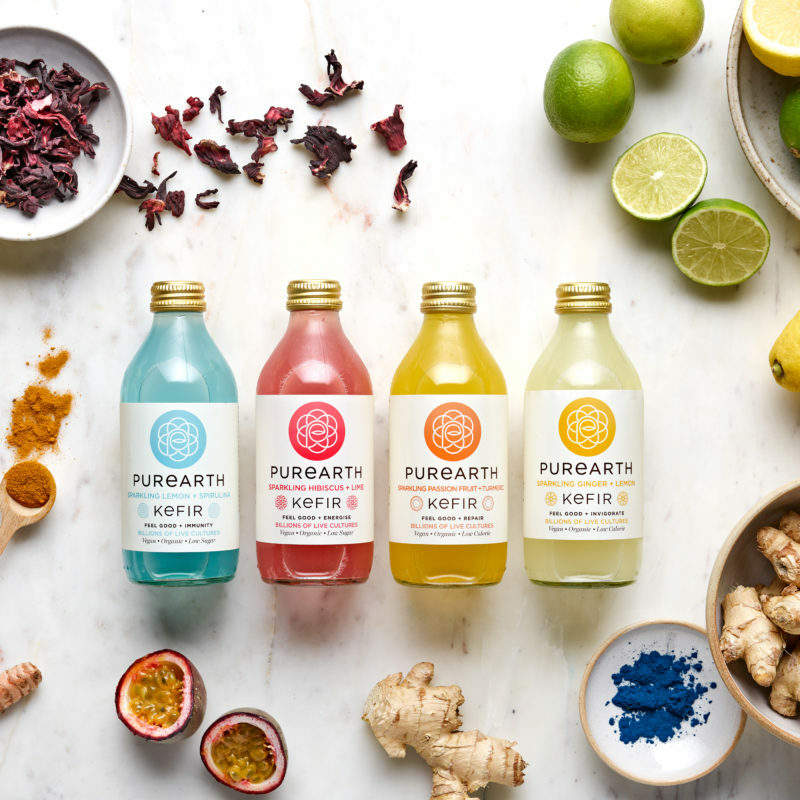 They come in four flavours; Lemon + Spirulina, Ginger + Lemon, Hibiscus + Lime and Passionfruit + Turmeric. Did you know that about 80% of your immune system originates in the gut? So in order for us to be vital and healthy, we have to have a strong digestive system full of good bacteria. Our digestive system has an intricate balance of beneficial and less beneficial strains of bacteria and yeast, and when the balance is tipped in favour of the bad guys, it can result in a wide range of health issues from digestive problems and weakened immunity, to hormone imbalances and skin conditions. In order to restore your gut, the beneficial strains need to be boosted and encouraged to grow, which can be done with kefir and certain fermented and pre-biotic foods. The idea of supporting optimal health through the gut was our motivation behind developing our water kefirs. By consuming them regularly, you’ll be giving your tummy some much- needed TLC! The collection of the bacteria (made up of viruses, fungi and organisms) that live inside our bodies (mostly in our digestive tract) is known as the microbiome. These bacterial organisms not only protect us from non-harmful and harmful pathogens but are also important for pretty much everything to do with our health, from hormone production, correct digestion, absorption of nutrients and even the production of serotonin (the key hormone that affects your mood)! It is no secret that a healthy gut is associated with the increase of energy levels and a strong immune system, but according to researchers, 95% of serotonin (‘The feel-good hormone’), is produced in your gut! No wonder it’s called our second brain! Serotonin is a chemical by which nerve cells communicate, also known as a neurotransmitter. It is generated in our bodies from an amino acid called tryptophan, which originates from the food we eat. With this in mind, our serotonin levels, therefore, influence not only the state of our digestive system but also our memory, moods and even the foods we crave! Researchers are now finally discovering and beginning to recognize that optimal diet and good digestion is crucial to the production and function of serotonin and the role it plays in our mental health and our gut. No wonder it’s called our second brain! Early evidence has begun to show that the microbiome in our system plays a significant role not only in your gut and mental health but also in various other organs like the skin! More and more researchers are beginning to recognise the correlation between the all three systems since the emotional state of an individual (be it happy, sad, stressed or anxious) can be triggered by changes or imbalances in the gut, AND we all know what our emotional state does to our skin! Lactobacillus (found in our Kefirs!) has been shown to have an antibacterial quality that helps you guard the microbes that give you dry and irritable/inflammed skin yet keeps the friendly bacteria unharmed! Bacterium like this can be great for your gut but also could work wonders on your skin, creating anti-inflammatory proteins that can help fight acne! There is vast interest in Bone health and the link to gut health too, since the bacteria in your gut is key to maintain a healthy immune system as well as absorbing nutrients like Calcium. These microbes have a huge influence on the level of the inflammatory signalling molecules that run through our bodies; the more good bacteria there is in your gut, the less the molecules flow- overgrowth of these molecules have been said to be directly linked to bone loss that could lead to diseases like osteoporosis. Better gut health could be key to preventing cardiovascular events. Consequently, the microbiome could influence heart disease, as well as many other problems like diabetes and even Alzheimers. Artery hardening happens as we age, but inflammation caused by imbalances in the gut could damage the function and lining of blood vessels. Some gut bacteria can convert foods like eggs and red meat into a substance called trimethylamine Noxide (TMAO). This damaging substance can further harm blood vessels which could lead to vascular events! 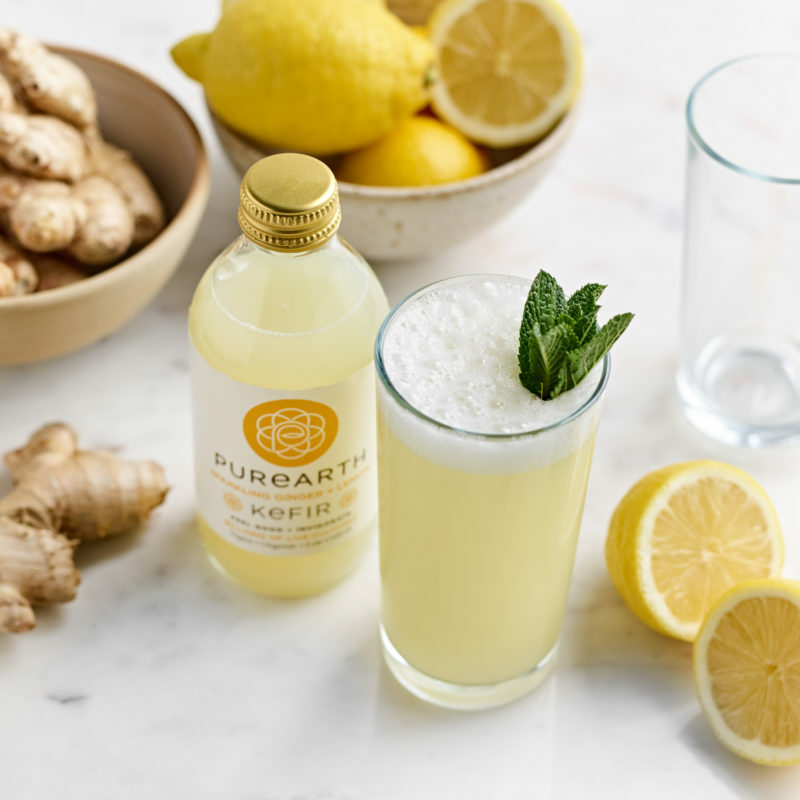 Our Kefirs are essentially a fermented drink made from live cultures of friendly bacteria/probiotics and yeast, creating a tasty gut-loving beverage, that could help optimise your gut health from the inside out! So here we have, the good bacteria VS bad bacteria. Each has their function and consequence if not treated correctly. Bacteria is a single cell organism that outnumbers the cells in our body 1.3:1, but they’re not all there to harm us. Bad bacteria are the ones who are up to no good. These guys can make you incredibly sick by multiplying in number, entering our bodies through liquids, food + the air we breath. We, of course, know all about antibiotics and their benefits, but unfortunately they wipe out all micro-organisms, including the good bacteria that we need. Good bacteria is the group that do not mean to harm us. They are often known as probiotics and provide us with essential nutrients, helping us protect ourselves from infections. Without billions of these little guys, we would struggle with optimum health. That’s why our Purearth kefirs have 5 strains + 10 Billion live + active probiotic cultures per 100ml!